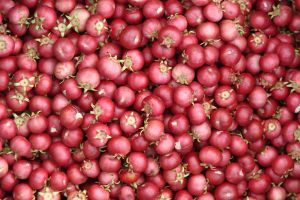 Ugni molinae, commonly known as Chilean guava, or strawberry myrtle, is a shrub native to Chile and adjacent regions of southern Argentina. The Mapuche Native American name is "Uñi". It is in the same botanical family as the Guava. The fruit is cultivated to a small extent. The usage of the fruit in cuisine is limited to southern Chile where it grows. It is used to make the traditional liqueur Murtado that is made of aguardiente and sugar flavoured by conserving murtas inside the bottle. It is also used to make jam and the Murta con membrillo dessert and in Kuchens.